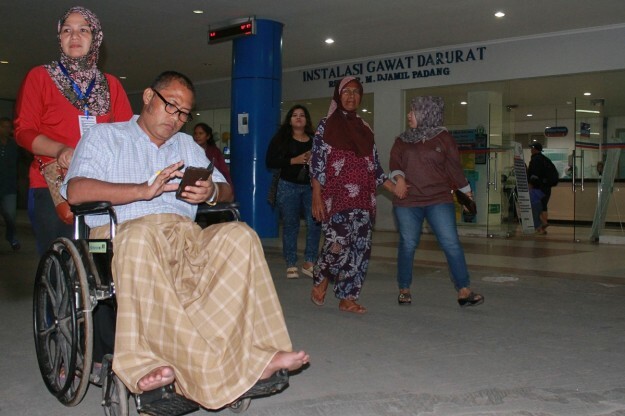 JAKARTA: A powerful and shallow earthquake struck Wednesday off Indonesia’s Sumatra island, sending panicked residents rushing from their homes in a region hit hard by quakes and tsunamis in the past. Local authorities issued a tsunami warning Wednesday but said it was unlikely to be severe. The 7.8 magnitude undersea quake struck at a depth of 10 kilometres (six miles) at about 6:50 pm (1250 GMT), the US Geological Survey said. The epicentre was several hundred kilometres from the Mentawai Islands, a small island chain southwest of the country’s main western island of Sumatra. There was panic in some areas, but officials said there were no immediate reports of casualties or damage. The closest major city on Sumatra to Wednesday’s was Padang. An AFP journalist there said people ran from their homes and fled to higher ground by motorbike, car or on foot. Traffic ground to a halt and there was a sense of panic on the streets, the journalist said. The local BMKG quake-monitoring agency issued a tsunami alert for parts of Sumatra, including West Sumatra, North Sumatra, Aceh, Bengkulu and Lampung. The small Mentawai archipelago is regularly hit by quakes and in 2010 was devastated by a quake-triggered tsunami that left hundreds dead. And Aceh on the tip of Sumatra was devastated by a quake-triggered tsunami in 2004. The tsunami killed more than 170,000 people in Indonesia and tens of thousands more in other countries around the Indian Ocean. BMKG head Andi Eka Sakya said that so far there had been no reports of major damage and the potential for a major tsunami was low. Disaster agency spokesman Sutopo Purwo Nugroho said tsunami warning sirens were activated and “people responded to the early warning by evacuating to higher places”. He said officials were still trying to make contact with the Mentawai islands, but so far there had been no reports of casualties or damage. The USGS also said there was a “low likelihood of casualties and damage”. “There are likely to be no affected structures in this region,” it added on its website. Indonesia sits on the Pacific “Ring of Fire”, where the meeting of continental plates causes strong seismic activity, and is frequently hit by earthquakes. Hundreds died when a major quake struck near Padang in 2009. Plans for evacuation shelters and improved roads to provide better escape routes from tsunamis since 2004 have mostly not been realised, according to experts. In Australia, to the east of the Indonesian archipelago, authorities said there was no tsunami threat to the Australian mainland but a marine threat to Cocos Island and Christmas Island off the east coast. Evacuations were not required, according to the Joint Australian Tsunami Warning Centre, but there was a possibility of dangerous waves and strong currents. People in Christmas Island were advised to get out of the water and move away from the immediate water’s edge.